Nimble is a new player in the portable battery charger world, but the company is headed by people who are not new. It is looking to make some changes by using recycled materials, with the package coming in a simple clamshell made of recycled materials. What you get inside that clamshell is the battery, USB-C cable, magnetic strap, a plastic bag, and small manual for some light reading. You can also recycle old electronics with the included plastic bag. 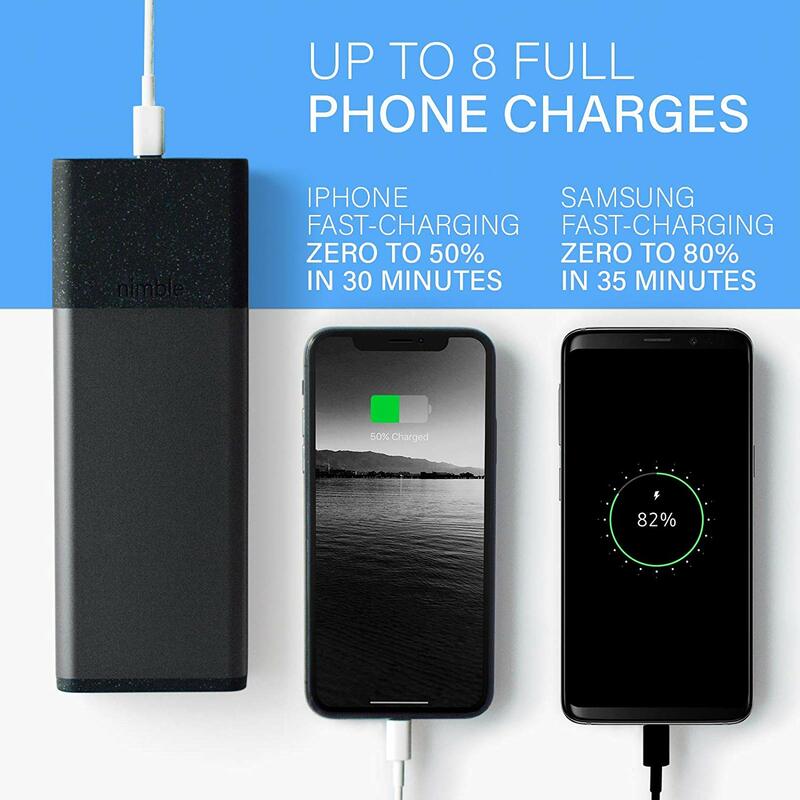 Nimble produces 3-day (10,000 mAh), 5-day (13,0000 mAh), 8-day (20,000 mAh), and-10 day (26,000 mAh) chargers. For this review, we’ll be checking out the 8-day charger. Even though the battery is made from reused materials, it does not seem to have conceded the build quality. It feels very sturdy and does not feel cheap. The battery shell is half aluminum and half metal-flecked black plastic that has a nice synthetic feel. All of the USBs, two USB-A connectors and a USB-C connector can be found on one side of the battery, and just around the corner from that is the row of LEDs to tell you how much battery life you have left. With a press of a button, five white LED lights will fill to show how much life you have left. And just below that button is another LED light that tells you what kind of charging you are doing. The GREEN light indicates normal charging while an ORANGE light indicates fast charging or PD-charging. When charging the battery, the five white LED lights will light up sequentially to show that it is charging, but it will only do that once. I didn’t realize that so I was waiting for the lights to flash as to indicate that it is charging. So don’t make that same mistake I did. 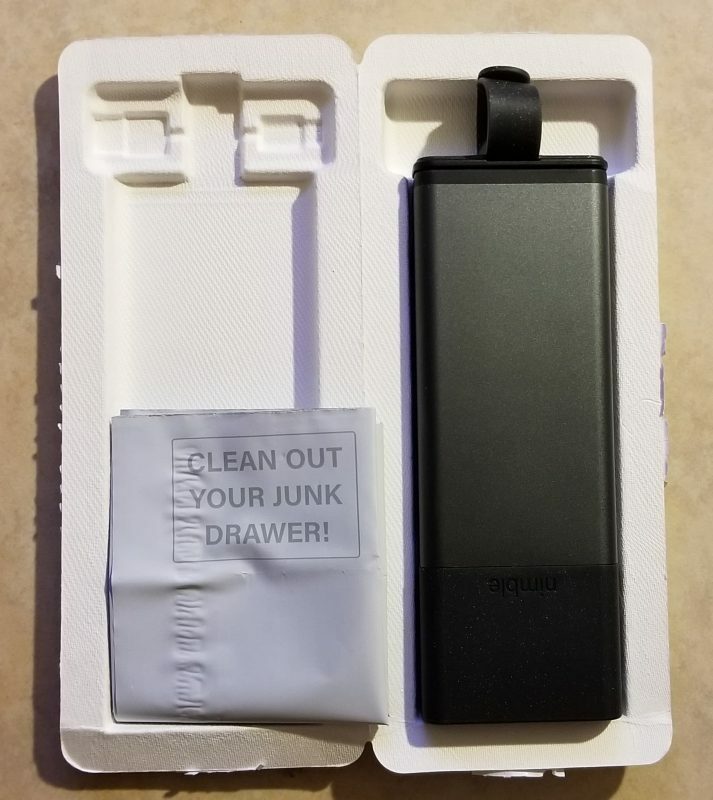 I received this battery pack with 3/4s of its charge left, so I let it charge overnight and it was ready to go the next day. My plan was to see if it really can last an entire 8 days. I took it with me to work and used it there instead of it being plugged into the AC charger on my desk. I used the charger while at home to charge my phone overnight. During my work hours, I rarely went below eighty percent before I plugged it in and with the fast charging, I was back to full within thirty minutes. And at home, the Nimble charger was charging my phone and my smartwatch overnight. With this type of routine, I was able to get 6 days of use going from full charge to depleted. So after charging it for a good day and a half, I wanted to test this on my Nintendo Switch since it is capable of Power Delivery (PD). I was hoping that it could charge the Switch while I was playing. Unfortunately, it didn’t charge it while playing, and that is the only downside I found. It did keep my Switch afloat until I got done playing. That may be due to the 18W output limit while other companies are putting out at least 30W output for PD chargers. The magnetic strap was also a bit of a downer since it is really not strong enough to stay on and be actually useful. But other than those two things everything else works really well and will charge your small electronics with no problem. As I said earlier, this works well with small electronics for charging, but when you get to a larger capacity, it may struggle to charge that device. I do like that the company is trying to do some good by using recycled materials and asking you to send your old electronics to be recycled. Click here to get more info or if you’re looking to buy. The post Nimble portable battery charger review appeared first on Nerd Reactor.